Learning about suspension may seem complicated and intimidating, but it doesn’t have to be. Photo: Sebastian Schieck. 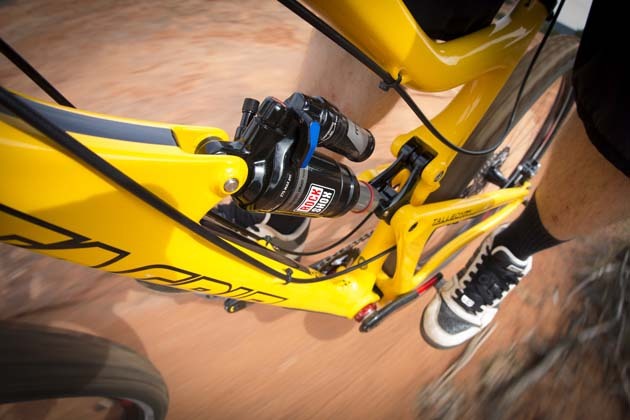 These days almost every mountain bike comes with front suspension at the very minimum. While it's not entirely necessary to have a full-suspension bike, it can help mitigate the impact of some trail features, mildly mask some deficiencies in rider skill or make a rider able to move faster through a trail with more margin for error. But suspension isn't the answer to every woe. It won't automatically make you better, faster or sexier, not unless you spend a little time on the basics first. Suspension is confusing—there's an ever-expanding array of mousetrap-like designs, kinematic graphs, fluid portal tuning diagnostic spreadsheets and voodoo black arts magic to make it all seem very difficult to understand. Suspension is scary stuff. I get cold sweats thinking about it despite having a front-row seat to some of mountain biking's most educated suspension technicians and having to spend a great deal of time learning about it all because it's my ‘job’ to do so. And I don't think I'm alone, which is why I see a lot of poorly adjusted or badly setup suspension out on the trails. I might be speculating here but I think some riders buy into suspension without much experience of how to set it up or use it. Because of this they might not be getting the most from their expensive investment. In reality, it's actually pretty simple. Well, the stuff that might help you or I is. This might not relate to many readers. Many of you are incredibly informed and well-read and think you have a good grasp of suspension. If you know everything already, then switch channels. This is Suspension 101: The Basics. So let's start with the definition of suspension. The whole is greater than the sum of the parts. Photo: Sebastian Schieck. Travel refers to how much the hub axle moves due to a suspension design/mechanism. Sag is how much the suspension compresses under the static weight of the rider. Must be set for the individual rider on each bike. This is achieved by adjusting the air pressure in the fork or shock, or in the case of coil-sprung units, swapping the spring. Preload is the force applied to a spring before the suspension is weighted. More preload equals less sag. Preload is mostly used in reference to coil shocks, but with air-sprung suspension, preload is essentially the air pressure. Increasing preload increases the amount of force required to start the shock in motion, which reduces small-bump sensitivity. Large amounts of preload are therefore discouraged. If proper sag can't be achieved with minimal preload, the coil should be swapped. In the case of air-sprung units, air pressure is adjusted until proper sag is achieved. Springs are either a coil or compressed air inside a sealed unit. Coil springs are most responsive but are far heavier and not as easily adjusted as air springs. The stiffness of the spring is controlled by the thickness of the wire and its length. Air springs work like a piston with a plunger compressing air inside a sealed chamber. The stiffness is controlled by the air pressure inside the unit and is adjusted via a shock pump. Spring Rate is the force required to compress a shock a given distance. In bicycle applications this value is recorded in pounds per inch. The larger the spring rate, the stiffer the spring. Coil springs generally have a more linear spring rate than air, meaning it takes the same amount of force to compress the coil through its entire travel. Air springs generally have a more progressive spring rate than coils as it moves through the travel (the more the shock is compressed, the harder it is to compress it further). The volume of the air chamber controls how progressive the shock is. More air volume will provide a more linear spring, while less air volume will provide more ramp up at the end of the stroke to reduce bottom out. Spring rates are selected based on body weight of the rider to give the desired amount of the sag. 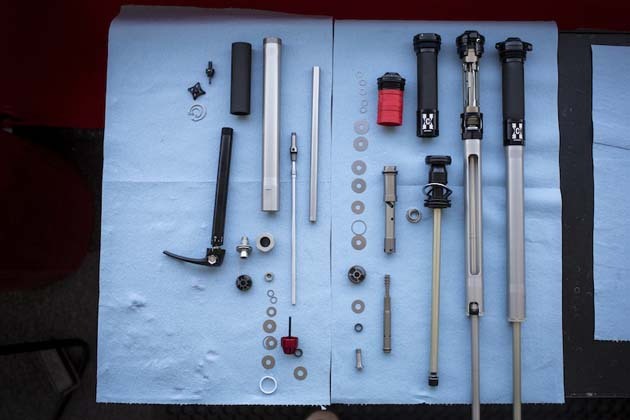 See below: The RockShox Bottomless Token video might be specific to RockShox product but what these handy little plastic inserts do is essentially reduce the volume of the air chamber to make the fork more progressive. Rebound is the speed at which the suspension returns after compression. Generally it refers to the rate of rebound damping adjustment on shocks. More rebound damping equals slower rate of return. Lockout is a mechanism that is sometimes built into shock units that allows it to be disabled and made substantially more rigid, a characteristic that might be favorable for climbing or sprinting on smoother terrain. Some designs have a 'blow off' valve, which will open the shock up again when struck by a large force. Pedaling Platform (often referred to as ProPedal) is a modification of low-speed compression damping that limits the suspension unit's movement during pedaling. They reduce the amount of oil that can flow through the suspension unit's compression damping circuits, making the shock harder to compress under such forces, providing a stable platform and making the bike feel more taut. Units work differently and to varying degrees of responsiveness. Generally this can be adjusted by the rider while riding through the use of a simple, often blue, switch on the unit. Suspension Fork. Bikes will generally have suspension forks on the front, with travel ranging from 80 millimeters to 200 millimeters. The larger amounts are generally reserved for downhill bikes but forks are so sophisticated these days that for general trail riding 130-160 millimeters is ideal—sometimes more, sometimes less depending on where you live and how you ride. Some forks may feature adjustable travel, making them useful for more all-round applications. Depending on the manufacturer and the cost of the fork it may provide adjustments like compression damping (high- and/or low-speed), pedal platform, rebound and spring rate adjustment (air). Rear Suspension Design. Your suspension is made up of the design of it and the damping unit. There's a difference. The design is the type of suspension platform on your bike. The unit is the smaller, often interchangeable, coil and damping unit that acts as an intermediary between the suspension design (the moving bit of the frame) and the static part of the frame. There is a larger number of variables that can affect the rear suspension – chain torque, chain growth, anti-squat, bob etc. – so there are a greater number of different designs, all which claim to eliminate or reduce the effect of these factors. There are single pivots, high single pivots, four-bar, Horst Link, FSR, Split Pivot, Virtual Pivot Point (VPP), DW-Link, Switch link, I-Drive, as well as many, many more. Most designs have their advantages, and few are truly awful. Some riders will prefer the characteristics of one over another due to their preferences and riding style. The challenge is to find one that works for you and you are comfortable with. An even bigger challenge is differentiating between fact and wishes. Tune in next week for basic setup and establishing base settings.